A familiar chant to be heard coming from the back of our car at the beginning of a journey is "story, story, story". My children are both huge fans of listening to children's books on CD (or even downloaded to the iPod and played over the car radio). As soon as I press play, quiet descends on the car as my normally vocal boys listen intently, interrupting only occasionally to clarify the meaning of a word. 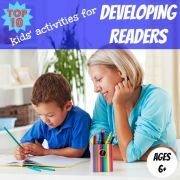 There are many advantages of encouraging your child to listen to children's books on CD (in addition to calmer car journeys), although try not to let it substitute reading aloud to your child yourself also. Audiobooks let your child enjoy books that are above her reading level and provide a good model for fluent reading. 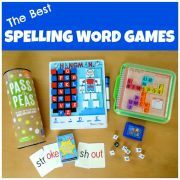 They help to develop listening skills and are a good way of enriching your child's vocabulary and introducing her to unfamiliar dialects or old-fashioned literary styles. Hearing a book read aloud by a talented storyteller can really bring a story to life, highlighting humour where it might have been missed, and adding drama and intrigue to a story. Listening to children's books on CD also helps to expand your child's background knowledge by using otherwise 'dead' time in the car to introduce her to new situations and experiences. All of these advantages of audiobooks provide a big boost to improving your child's own reading skills. 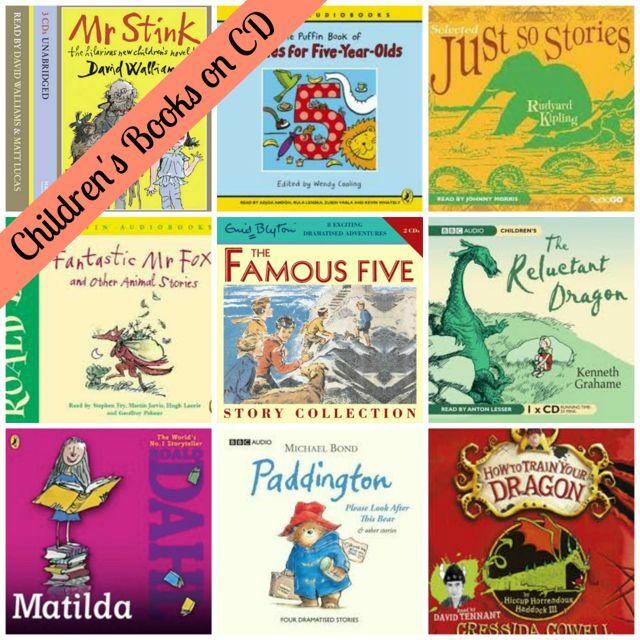 Here are some of the children's books on CD which we have enjoyed the most, with those suitable for younger listeners towards the top of the list and those for more advanced listeners towards the end of the list. Fantastic Mr Fox and Other Animal Stories by Roald Dahl. One of the first children's books on CD which we listened to when my sons were 3 and 5 years old was this brilliant collection of four short stories. As well as the story in the title, it also contains recordings of "The Giraffe and Pelly and Me", "Esio Trot" and "The Enormous Crocodile". We have listened to all of these stories endlessly since and they remain firm favorites of the entire family. Winnie-the-Pooh by A.A.Milne, which in our version is brought to life through the wonderful voices of Alan Bennett. Paddington by Michael Bond. We have the version of dramatised stories introduced by Michael Hordern, who narrated the original BBC TV series, which we love, but there are other good versions available too. The Puffin Book of Stories for Five-year-olds edited by Wendy Cooling. This audiobook contains a mix of traditional and modern short stories from around the world which my children never tire of listening to. There is also a version for Six-year-olds, Seven-year-olds and Eight-year-olds. Jack and the Beanstalk and Other Stories from BBC Childrens Audio. As well as the book in the title, "Goldilocks and the Three Bears", "Puss in Boots", and "Snow White" are included in this collection. My Completely Best Story Collection by Lauren Child contains five Charlie and Lola stories which my children love to listen to. Endearing and funny and I am forever hopeful that Charlie's kind ways with his younger sibling will rub off on my eldest! The Reluctant Dragon by Kenneth Grahame. Our version is read by Anton Lesser who keeps my little ones enthralled despite the sometimes sophisticated vocabulary. Just So Stories by Rudyard Kipling. The language is a little complex and old-fashioned but my children still find it entrancing, particularly when read by Johnny Morris (of "Animal Magic" fame) with his superb animal characterisations. Three Children's Classic Stories from BBC Audio with full-cast dramatisations of Ballet Shoes, The Secret Garden and The Railway Children. We loved all three of these classic tales. Great family listening! The Famous Five Short Story Collection by Enid Blyton was my children's first introduction to this classic children's author and they loved listening to these eight dramatised short adventure stories. Other longer children's books on CD in this series include Five Have a Mystery to Solve and Five Fall into Adventure . King Arthur and the Knights of the Round Table by Benedict Flynn and read by Sean Bean. There is a bit of blood and gore at the end which is probably not so appropriate for younger listeners, although my two didn't seem to mind! Five Children and It by E. Nesbit and read unabridged by Samantha Bond. This delightful story about five children who find an ancient sand-fairy who grants their wishes kept us all captivated to the end. Matilda by Roald Dahl is about a gifted little girl with horrible parents and a terrifying headmistress. This version is unabridged and read by Kate Winslet. It is part of a series of Roald Dahl audiobooks retold by famous people including The BFG , Danny the Champion of the World and Charlie and the Chocolate Factory . The Worst Witch by Jill Murphy and read here by Miriam Margolyes tells about the antics of Mildred Hubble, the worst student at Miss Cackle's Academy of Witches. How To Train Your Dragon by Cressida Cowell recounts the dragon-training exploits of a young Viking and is brilliantly told here by David Tennant. My boys were enthralled from beginning to end. It is followed by How to be a Pirate and How to Speak Dragonese . Mr Stink was the first of David Walliams' children's books on CD which we listened to and we loved it. Brilliantly narrated by the author and Matt Lucas, this touching story about a smelly tramp and an unhappy little girl is also hilariously funny. After listening to it we were hooked on David Walliams and so followed it up with Gangsta Granny , Ratburger and Billionaire Boy . You're a Bad Man, Mr Gum is a bizarre but hilarious story by Andy Stanton about Mr Gum, a mean, grumpy old man and Polly, a kind girl who stops Mr Gum's evil plots. Our version is read by Kate Winslet who had us all in stitches. You can also buy the Mr Gum Collection in which Kate Winslet reads the first four books in the series. For more ideas of enjoyable children's books on CD have a browse through the winners of the Notable Children's Recordings List, which the Association for Library Service to Children compiles each year of the best of the best in children's recordings. 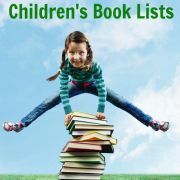 An interesting list of recommended children's books on cd can also be found at Capitol Choices. Each year since 1996 a group of librarians, teachers, booksellers and other children's literature specialists around the Washington, D.C. area select a list of outstanding books and audiobooks for children up to the age of sixteen. For each recommendation in the list of audiobooks there is a brief synopsis and a suggested age range, although unfortunately the list is not searchable by age range. 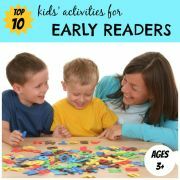 Most of the audiobooks are for ages 9 and over although there are some suggestions for younger children. Each year a list of Amazing Audiobooks for Young Adults is announced by The Young Adult Library Services Association, a division of the American Library Association, featuring notable audio recordings for ages 12-18 years. 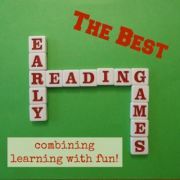 You can also find good suggestions on the Parents' Choice Award Winners website in the Audio Book category. The Ten Best Children's Audio Books from The Independent newspaper in the UK. Listen to This! Audio Books from Reading Rockets. The Travel Savvy Mom's age-by-age guide to the best audiobooks for kids. Of course, in this day and age you do not have to buy the CD to listen to the book, you can just download it on-line. 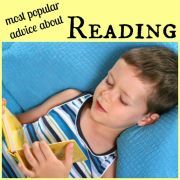 There are a few interesting options for downloading free audiobooks specifically for children. Many old classics, such as 'Black Beauty', 'The Wonderful Wizard of Oz', 'Treasure Island' or 'The Secret Garden' are in the public domain and recordings of these classic children's books on CD made by volunteers can be downloaded for free onto your computer, iPod or MP3 player. You can also access free children's books on CD via the excellent iPhone Free Audiobooks app so that you can listen to your favourite stories while on the go. Storynory has an online library of free audio stories for children (read with a British accent) which you can listen to on your computer, download in MP3 format or subscribe with iTunes for easy upload to your iPod. There is a mixture of new stories, fairy tales, and specially adapted myths and histories. The Story Home is another great source of free stories for children, this time read with an American accent. As with Storynory, these stories can be played on your computer or easily downloaded to an iPod or iPhone. iPhone apps also exist for both of these websites. To purchase audiobooks on-line try audible.com in the USA or audible.co.uk in the UK.